Have you heard in recent news about this killer plant? A word of advice, Do Not Touch This Plant! It may not be a killer but it will sure burn you! Symptoms can be quite severe and progress from red and irritated skin to large, fluid-filled blisters resembling burn symptoms. Affected areas may remain sensitive to ultraviolet light and re-eruptions of lesions and blisters may occur for several years. The good news is, your moist skin must come in contact with sap from broken stems, crushed leaves, roots, flowers or seeds and then be exposed to sunlight for symptoms to occur. Upon exposure, symptoms will take 1-3 days to appear. 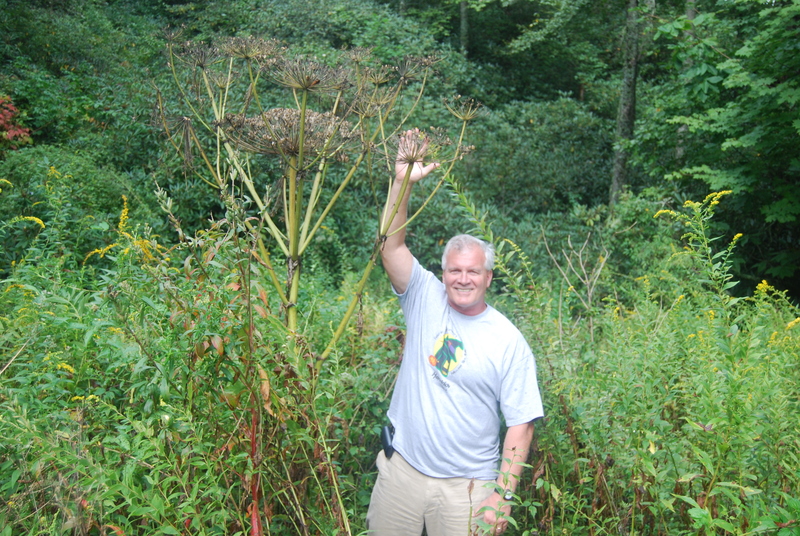 Giant hogweed (Heracleum mantegazzianum) resembles several of our natives but is much, much larger. Plants closely resemble Cow Parsnip (Heracleum lanatum), Queen Anne’s Lace (Daucus carota), and even Elderberry (Sambucus canadensis) but can be upwards of 10 to 20 feet tall with a leaf spread of 5 feet and flowers in an umbrella shape up to 2 feet wide. For more information on identification and comparison to look-alikes, visit the New York Department of Environmental Conservation. These are invasive plants listed on the federal noxious weed list, North Carolina Class A Noxious weed list, and listed by several states as a prohibited plant species. In North Carolina, noxious weeds are regulated through the Plant Industry Division’s Plant Protection Section of the North Carolina Department of Agriculture and Consumer Services (NCDA&CS). 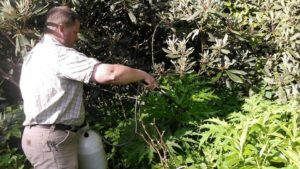 There is a current Pest Alert out through their office for Giant Hogweed. 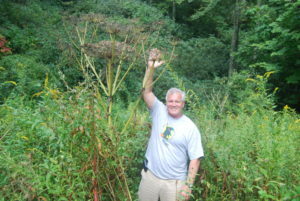 Giant hogweed, like many other noxious weeds, was brought here as an ornamental and escaped cultivation. It can move rapidly producing up to 100,000 seeds in a season. The seeds can remain viable in the soil for a period of 10 years. The plant can grow among a wide range of habitats but prefers rich, damp soil found along streams, roadside ditches, or other disturbed moist areas. Most typically it is found in a cooler climate like the mountains of North Carolina. North Carolina Department of Agriculture and Consumer Services is currently working to eradicate giant hogweed in the state. They have identified and mapped the few infestations known in the state for this purpose. 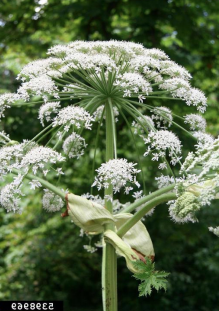 If you feel that you have spotted giant hogweed, please contact your local N.C. Cooperative Extension office or contact NCDA&CS Weed Specialist, Dr. Bridget Lassiter (919/707-3749; bridget.lassiter@ncagr.gov). Find your local N.C. Cooperative Extension office. In light of being in the public eye over the last few weeks you can rest easy in North Carolina. 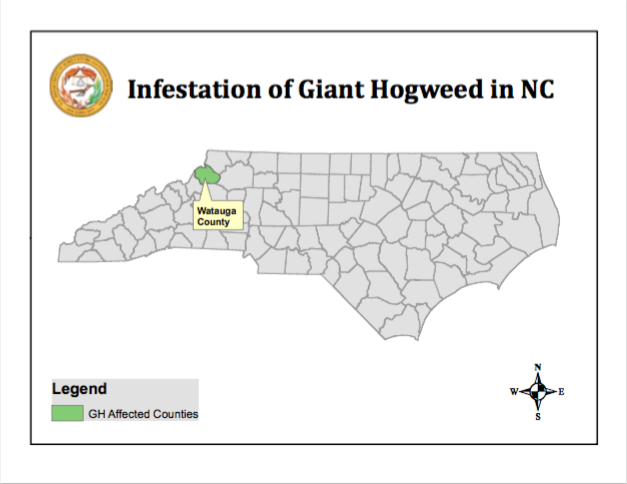 Infestations of giant hogweed are only found in Watauga County in North Carolina according to NCDA&CS. These areas were planted by a homeowner and have been under quarantine for nearly a decade. 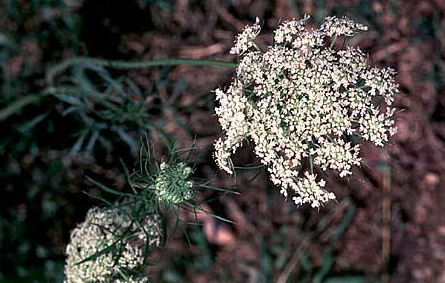 There have been no known instances of the noxious weed outside of Watauga County, NC. More information on identification, distribution, biology, and health impacts can be found through this New York Department of Environmental Conservation factsheet. This article was written by Gene Fox, N.C. Cooperative Extension Area Consumer Horticulture Agent, serving Beaufort, Hyde, Tyrrell, and Washington counties. Gene has more horticulture information on the Blacklands Area Horticulture Facebook page and @Foxplantguy on Twitter, including upcoming programs and volunteer opportunities.